The table below lists some of the Orthodox Christian parishes in Toronto and vicinity. *The list above is not necessarily exhaustive. It is only meant to give an idea of the geographical distribution of Orthodoxy in our city and its surroundings. The order in which the parishes are listed is based strictly on criteria of accessibility (language, proximity to subway, parking availability, and centrality of location, using the Toronto City Hall as the point of reference). The language in column 3 of the table is the language in which the Holy Eucharistic Liturgy is celebrated on Sunday morning. Churches that use a language other than English on Sunday morning may have all-English services at other times of the week. To find more information about the churches listed in the table, use a search engine such as Google. It is a good idea to contact the parish office or priest ahead of any first-time visit to an Orthodox church. Looking at the table above one cannot miss the ethnic diversity that is characteristic of the Orthodox Church. Does that diversity, however, mean that the Church is divided? Although it is true that there is no single authority like a Pope in the Orthodox Church, nor a state like the Vatican, the Church is united. It consists of several administratively autonomous churches, which are united in faith, doctrine, practices of worship, and adherence to laws and regulations, as established in seven worldwide councils a long time ago. To summarize this unity, the Orthodox faithful say that they are “in Communion”. Quite literally, if you were a member of one Orthodox parish and decided to attend Liturgy in another, you would find yourself at home, even though the language of Liturgy might be different. Every movement and every detail of the Holy Eucharist is identical, regardless of language, and despite some superficial variations in style and music. And if the priest knows that you are a member of another Orthodox parish, he will give you Holy Communion, if you are prepared for it. It has occurred many times in history that two administratively different Orthodox Churches found themselves isolated from each other, perhaps under the dominance of different hostile political regimes. The advance of Islam created such circumstances, as did in more recent times the imposition of Communism in Eastern Europe and Russia. However, as soon as the Churches emerged from those dark historical periods, they found themselves still in full Communion. Orthodox people believe that this amazingly lasting unity is not their doing. They do not congratulate themselves for it. They believe that the Holy Spirit is at work «welding together the whole institution of the Church» as chanted in one hymn of the Vespers on the Sunday of Pentecost. It is worth noting that this unity existed throughout Christendom, including Western Europe, through the first millennium. For its first 1000 years or so, this united Church stretched from Spain to the Middle East and from Ireland to Egypt. With the breaking away of the Church of Rome in 1055 AD, and its subsequent adventurous initiatives (Crusades, Scholasticism, Inquisition etc. ), Western Christendom took a very different course, while the East has remained united to this day, in the same way as it was in the first millennium, with all its local autonomy and cultural diversity. This is essentially what is called Orthodox Church today. In order to better understand the Orthodox Church in Canada, and specifically in Toronto, one has to consider the prevalent historical circumstances, as the Church was developing in this country. Of course, one must also see this development in Canada in the light of the natural ways in which the Church developed ever since its beginning, since the time of the Apostles. Let us examine these two aspects briefly, starting from the latter. The Orthodox Church is the original Christian Church. It was established by Jesus Christ in AD 33. The day of Pentecost is universally accepted as the day on which the Church was established. That is when the Holy Spirit descended on the Twelve Disciples, as Jesus had promised. Many people believed in the Gospel of Christ on that day, and many more in the months and years that followed. After this initial gathering of momentum in the Holy Land, the Church spread quickly in all directions into non-Jewish lands. Specifically in lands belonging to the Roman Empire at the time, the Church grew rapidly and, by the end of the first century, it had established itself firmly in Syria, Asia Minor, Greece, south Italy and Rome itself. The book of Acts and Paul in his Letters name many of these early local churches. Also, the first three chapters of the book of Revelation offer us a snapshot of seven of the most important local churches of Asia Minor. From these Scriptural sources it is clear that a uniform process of growing took form right from the start. The Apostles would preach the Gospel in a city or town, and as a congregation formed around them, they would appoint a bishop to oversee it and lead it. As an adjacent region accepted the Gospel, that bishop would look after it until it grew large enough to warrant its own bishop. From a technical perspective, this was a naturally decentralized and infinitely expandable system. In this way the Church grew spontaneously and naturally, much like a vine grows on a wall, more-or-less following its lines and contours, eventually looking as if it were part of the wall. The bishops of larger urban centers looked after more congregations and were more likely to host regional meetings of bishops (synods), than were bishops of smaller or more remote communities. Thus the dioceses of big cities grew naturally more prestigious and became more respected, without anyone objecting to it. This did not in any way mean that they were considered spiritually superior. So, the map of the Church looked very much like the administrative map of the Roman Empire, with the most important dioceses situated in the main administrative, commercial and cultural centres of the Empire or along its main commercial routes. By the middle of the 3rd century the Church had spread throughout the Empire, and although it was decentralized, more like a loose confederation of local congregations, several hubs were keeping it all in unity. Alexandria, Antioch and Rome had already emerged as major bishoprics. The first three centuries of the Church’s history were definitely a time of tremendous growth, and this leads one to expect that the Church would also settle organizational and administrative matters and mature into a well structured body in that same period of time. However, this did not happen. The process was inhibited by the Great Persecutions. The persecutions were the result of attempts by the Roman state to establish and maintain unity of religious faith in the Empire, by promoting the notion that the Emperor was divine. Christians, although they did not challenge the authority of the Emperor to rule, were unwilling to offer sacrifice to him as if he were god. Many Christians perished in those persecutions, especially in the last and most horrific one, by Emperor Diocletian. It was only after Christianity emerged from this last persecution that the Church had the opportunity to organize itself and at the same time provide answers to some major questions of Faith, which by then had grown to demand immediate attention. Constantine the Great, the Emperor who succeeded Diocletian, had a Christian mother, St. Helena, was sympathetic to Christianity, and eventually became himself a Christian. Like Diocletian, he too, had an interest in unifying the Empire on a religious basis, but he saw Christianity rather than paganism as the religion for that purpose. Also, during one of his military campaigns, Constantine claimed he had had a vision, by which his upcoming victory was attributed to the bright sign of the Cross in the vision. Hence Constantine took a personal interest in first allowing Christians to practice freely and then leading them and supporting them in their efforts to establish order and organizational hierarchy, by encouraging them to sort out doctrinal matters that had arisen over the first three centuries. For all these reasons Constantine called the Council of Nicaea (also called Synod of Nicaea), which came to be known as the First Ecumenical Council (AD 325). The Council of Nicaea, which was modeled after the Apostolic Council, which the Apostles left behind as an example of how important matters should be resolved in the Church (Acts 15, 1-30), paved the way for Christianity to become the official religion of the Empire. Constantine made it a point not to interfere with the content of the discussions and decisions of the Ecumenical Council. The bishops alone could decide on church matters. The Emperor’s role was that of an enforcer. This way he guaranteed the unity of faith and guarded against schism. Most of Constantine’s successors respected this basic principle. As a modern historian puts it, “The Emperor’s duty was to listen to the voice of the whole Church; what the voice said was for the bishops to decide” (Lars Brownworth. “Lost to the West”. Three Rivers Press, New York, 2009). The Council of Nicaea was attended by 318 delegates from all of the local churches of the Empire. The pattern we described above was already clear. The delegations from the major centres of the East, Alexandria and Antioch, were dominant and well respected in the deliberations. So was the delegation from Rome. As a result, Rome, Alexandria and Antioch were the first three Patriarchates that were established (the Patriarchates of Rome and Alexandria are better known as Papacies). With Constantine’s relocation of the Empire’s capital from Rome to Byzantium, and his establishment there of the city that was named after him, Constantinople, an old local church that had been established there by Andrew the Apostle experienced steep growth. Being the church of the new capital, the Church of Constantinople soon became a Patriarchate. Finally, the Fourth Ecumenical Council elevated the Church of Jerusalem to Patriarchate status in AD 451. These five ancient Patriarchates formed the leadership of Christendom until 1055 AD, when the Papacy of Rome broke away from the Church. Since that schism, the other four Patriarchates have remained united to this day. In the 1800’s some new patriarchates were formed in countries whose population had been Orthodox for a long time, such as Russia, Ukraine, Romania, Georgia etc. Altogether today there are 16 autonomous churches, 9 of which are patriarchates and 7 are headed by Archbishops. Together they form the top leadership of the Orthodox Church. See section “The Orthodox Church Worldwide” for more information on these Patriarchates. The Council of Nicaea took place in a remarkably open-minded spirit, in terms of status in society or rank in the Church. It is noteworthy that in the discussions on the doctrinal issues, the most important delegate turned out to be Athanasius, a humble deacon of the Church of Alexandria. Also, most of the delegates were poor people and many literally had scars from the tortures they had suffered in Diocletian’s Persecution. In the same open-minded spirit, the Churches of the major cities (Rome, Alexandria, and Antioch) were never understood to be superior spiritually or otherwise. It was the convenience of their being in the central locations and the amount of activity that was taking place at these locations that gave them that status, and nothing more. Later, when the Pope of Rome gradually began to demand to be treated as the head of the Church, the patriarchs and bishops of the east were not happy. For them there was only one head of the Church: The Lord Himself. They did not mind accepting the Pope of Rome as “first among equals”, perhaps something like a chairman at meetings, since he was the bishop of the old historical capital of the Empire, but they refused to accept the claim of Primacy, as it was understood by him, which in effect attempts to send Christ to reside in Heaven and puts a man at the head of the Church here on Earth. Consistent with its traditional pattern of expanding organically like a vine, the Orthodox Church spread into the Americas by following the patterns of distribution of the immigrant populations that had carried Her with them. Unlike Roman Catholicism and the denominations of the Reformation, which followed in the steps of the colonizers, Orthodoxy was brought into the New World by immigrants who came much later, from countries that were not participants in the Great Explorations. The only exception was Alaska. Alaska was colonized by Russia from the Pacific side in the 1700’s. After trading posts were established there, Russian merchants invited Russian clergy for their religious needs, and monks to serve as missionaries to the Natives. The Orthodox Church in Alaska is thus the only Orthodox Church in the New World that was established by Imperial order, namely that of Catherine the Great of Russia. Since Tsar Alexander II sold Alaska to the United States in 1867, that church expanded into some parts of the United States and possibly Canada, too – a church established in Wostok, Alberta in 1898 may have been the first Orthodox Church in Canada. In 1905, a diocese that was based in Sitka, Alaska, became an archdiocese and established headquarters in New York. By that time, however, several other Orthodox parishes existed as a result of immigration. The existence of that Russian church in New York went largely unnoticed by immigrants who were arriving in large numbers from other countries of Eastern Europe, the Balkans, and the Middle East. Greek, Serbian and Syrian churches had already been established at least as early as the 1890s. That was only the beginning. Throughout the 20th century large waves of immigrants poured into North America, forming communities and churches spontaneously. Therefore, with the exception of Alaska, Orthodox Christianity came to the Americas primarily along with immigration from the traditional countries of Orthodoxy. Typically immigrants were young and energetic people. Soon after their arrival they would want to find a job, settle in a home and then get married and raise a family. They needed a priest to marry them and baptize their children. As Christians, they wanted to go to church, at least on the major holidays, and have Holy Communion. Since there was no pre-existing Orthodox church in Canada, the needs of those communities were met by the churches in the original countries. In response to letters from immigrants, those churches sent priests and bishops, and as the communities grew bigger, archbishops were established and finally Seminary schools were created in order to grow local clergy. The result is the diversity of Orthodox Church communities we see in Canada and the US today, based on culture, language and ethnicity. Yet, there is absolute uniformity in faith, worship and church practices. In the 1960s the bishops and archbishops of the various Orthodox Churches in the Americas came together to a synod in order to discuss common directions in their country. A standing conference was thus established, named SCOBA (Standing Conference of Canonical Bishops of America). In 2010, SCOBA dissolved itself in order to be succeeded by another Synod, with a new and broader scope. That Synod is called Episcopal Assembly of North and Central America. Canadian bishops of the various Orthodox Churches in this country have also participated in the 2010 process, and requested that they be granted permission to form their own separate and distinct Episcopal Assembly of Canonical Orthodox Bishops of Canada. Approval of their request by the Ecumenical Patriarchate is pending. Every year on the Sunday of Orthodoxy (a feast established in the 800s AD) the Orthodox churches of Toronto come together into a Pan-Orthodox service and celebrate vespers. 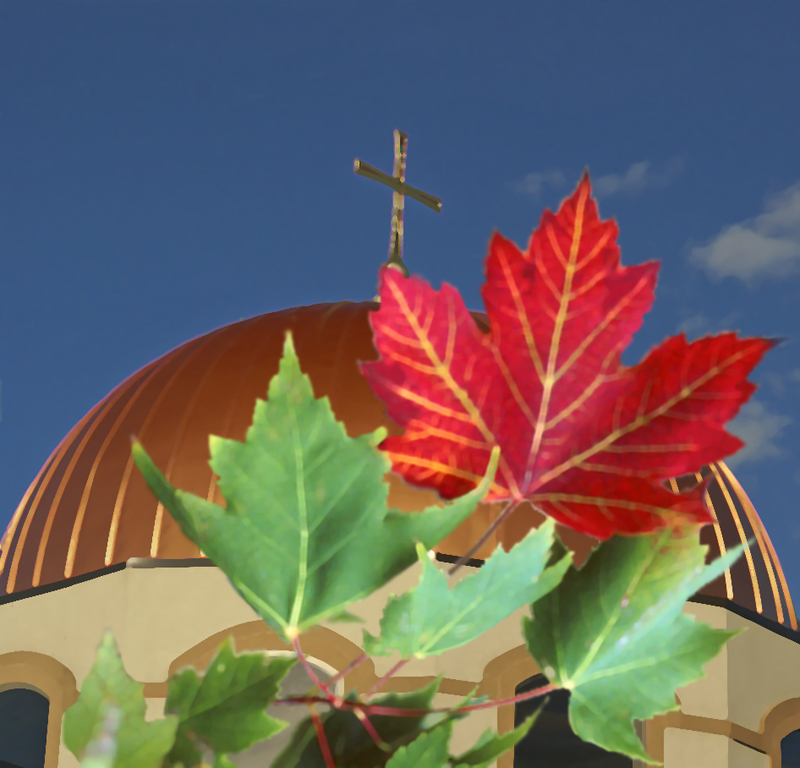 It is conceivable that all Orthodox churches in Canada will converge to one single Canadian Orthodox Church some day. Consistently, as always, with the analogy of the live vine, such a process is necessarily long, since artificial decisions taken in conferences and councils are never enough. The live body of the Church, the vine, will need to grow naturally to this point. 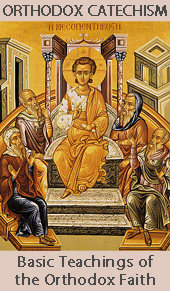 The Orthodox Church is the original Christian Church. It was established by Jesus Christ in 33 AD. This church remained united throughout the first millennium. For its first 1000 years or so, it stretched from Spain to the Middle East and from Ireland to Egypt. Early in the second millennium (AD 1054-55), Christendom split into an Eastern part and a Western part. The boundary between the two parts runs roughly through the middle of Europe, with Rome being the main reference point. The Western part of Christendom was led by the Papacy of Rome into what became known as Roman Catholic Church, an organization that introduced numerous innovations to Christianity, in order to develop itself into a world power. The Eastern part, led by the remaining four of the ancient Patriarchates, remained loyal to the Christian traditions – the traditions that had developed right from the onset of Christianity. This is what is called Eastern Orthodox Church. She remained committed to the teachings of the Apostles, continued to be devoted to the original doctrines and ways of worship, and remained dependable and accountable to its members, laity and clergy alike. 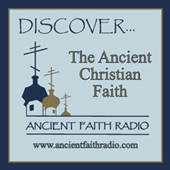 The Eastern Orthodox Church has found no good reason to alter the original teaching of Jesus Christ and the original practices of worship and administration. A snapshot of the Orthodox Church in 2011 would show a church that is no different from the church of AD 1055 and hardly different from the church in Emperor Justinian’s time (c. 530 AD). Hence one can think of the Orthodox Church as the “Historical Church”. This Church is alive and well today, as it was then. Moreover, its faith, its doctrine and its practices have remained intact. First, this Church is to be found in the lands where Christianity originally flourished, that is, Israel/Palestine, Syria, Cyprus, Greece, Asia Minor, Lebanon and Egypt. Second, it is to be found in Eastern Europe, in Russia and the other countries surrounding the Black Sea, as well as in the countries of the Balkan Peninsula. Over the many centuries, the Eastern Orthodox Church has expanded geographically in all directions, to include peoples as diverse as Russians, Koreans, Americans, Australians, Maya and Aleuts! There are many active and flourishing missions today in Africa, China and Taiwan, Punjab, Central America, and in many other places around the world. It is estimated that 300 million people are Orthodox Christians, which makes it the second largest Christian denomination after Roman Catholicism. Unlike Roman Catholicism, Eastern Orthodoxy has no single leader like a pope. Yet, it is united in a single body - unlike Protestantism. Below is a list of autonomous Orthodox churches. These churches are in full communion, which means that they see each other as local churches, members of a single religious body. Orthodoxy is also the dominant religion in Belorussia and Ukraine. As one can see from the list above, the geographical core of the Orthodox Church is the eastern half of Europe and the Eastern Mediterranean. The most spectacular expansion of Christianity was accomplished with God’s help by the Russians, who, between 988 and 1917 AD, spread the Gospel as far as Korea on the Pacific coast and across the Ocean to Alaska. Since the early 20th century, the Orthodox Church has been steadily expanding in the Americas. Particularly since the late 1980s, entire parishes in the United States have joined the Orthodox Church. The original, disciplined and unaltered Christianity that was once also the Christianity of the British Isles, and of the rest of Western Europe, is no longer hiding in immigrant communities. Well known Evangelical Protestants, Anglicans and Roman Catholics have joined and are outspoken proponents of Orthodoxy. © 2014 Saint Athanasius Orthodox Christian Mission. All rights reserved.